We have unboxed the O+ 360 Alpha Plus and we're loving it so far. Check out our First Impressions and the Antutu Benchmark of the handset. I have encountered several packaging of the local smartphone company but O+ is quite exceptional in presenting their products in a semi-compact but well-built box. Their latest, the O+ 360 Alpha Plus box, basically comes in three tones (white, red and black) and a whole lot of bows and frills. The handset is the company's entry to the wildly selfie-centered smartphone market which features a unique way of processing your pictures thru the built-in Instant Beauty Fix software, but we'll talk about that in our actual review of the unit. The company presents the handset with a slide-through ribbon that you need to pull to reveal the handset. Underneath the main compartment lies a set of boxes which contains the USB cable (for data transfer and charging), wall outlet adapter, headphones with cloggers, a microfiber cloth and a set of manuals. 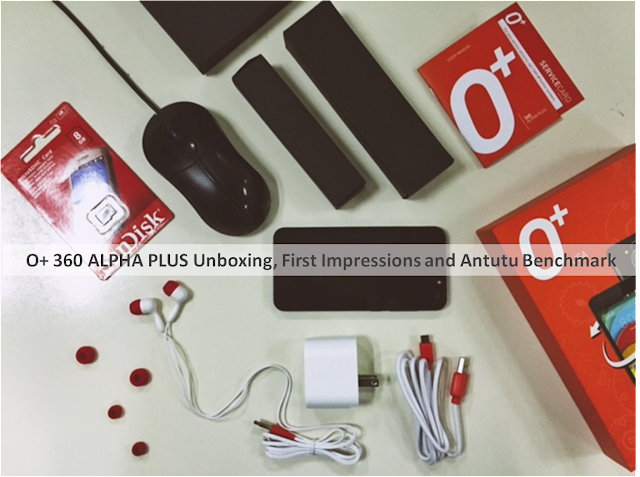 O+ is also very generous in including an 8GB of SanDisk microSD card and a screen protector. Opening the box gave a premium treatment which I haven't experience from any other local brand that I have unboxed for quite some time. The O+ 360 Alpha Plus is surprisingly a well-built device. Due to its premium-ish feel, I could hardly put it down to check the other contents of the box. I must agree, it is simply one of the best looking sub-5K phones I've seen in a while. The back of the device is a removable panel that offers a matte polycarbonate plastic. Since it has a matte finish, does NOT attract fingerprints which is a splendid design factor for me. The back panel houses the subtle 5MP rear camera with the LED flash and the 360 touch module that you can use in navigating your device - yes, the phone is capable of that innovation. Towards the bottom, you'll find the O+ USA branding. Flipping the device, there's no denying the fact that the 5MP front camera and its front-facing LED flash are very imposing. The top portion of the front panel also houses the light sensor and the earpiece. Likewise, the 4.5-inch qHD display is also one of the handset's highlights, it frames a 540 x 960 pixel resolution which offers a capable 240 ppi pixel density. There's also the on-screen menu buttons which consumes a significant amount of the already small screen real estate. But knowing that these buttons are very responsive technically shook off the handset's shortcomings. We'll talk more about the display in our review. On the lateral side of the handset, you'll see the power (sleep/wake) button on the right side below the volume rocker. The top side houses the microUSB cable and the 3.5-millimeter jack which is a common scheme with Android devices of this size. The bottom part features a tiny slot for the microphone. 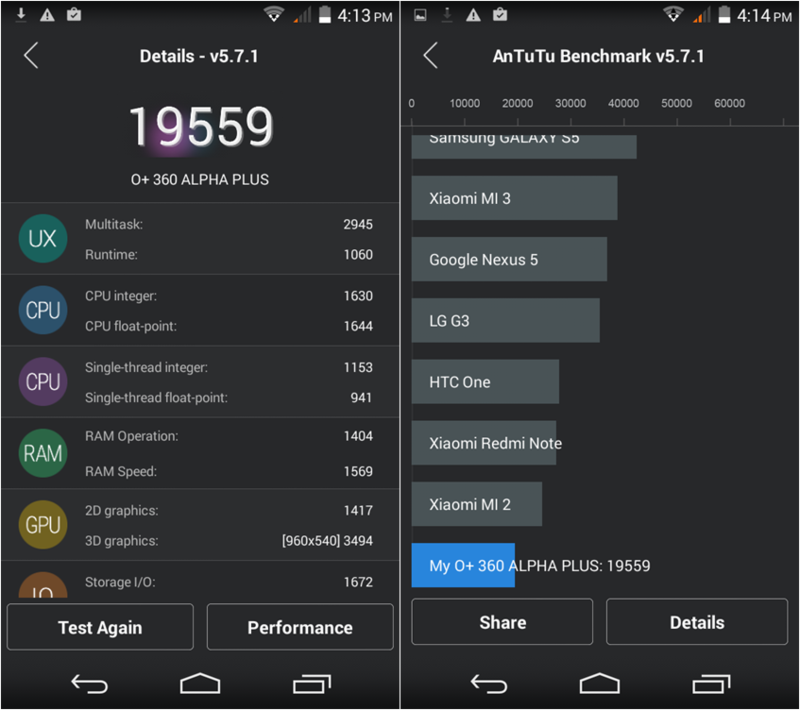 The O+ 360 Alpha Plus fairly scored 19559 points when we run the Antutu Benchmark version 5.7.1. 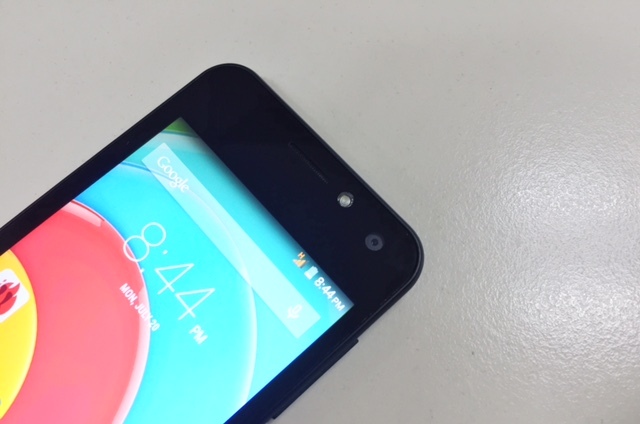 It sits below the Xiaomi Redmi 2 in the device ranking scale. What's more interesting is the fact that the benchmark revealed that it is powered by a MediaTek MT6582 which packs 1.3 GHz of quad-core Cortex A7 and Mali-400 MP GPU. 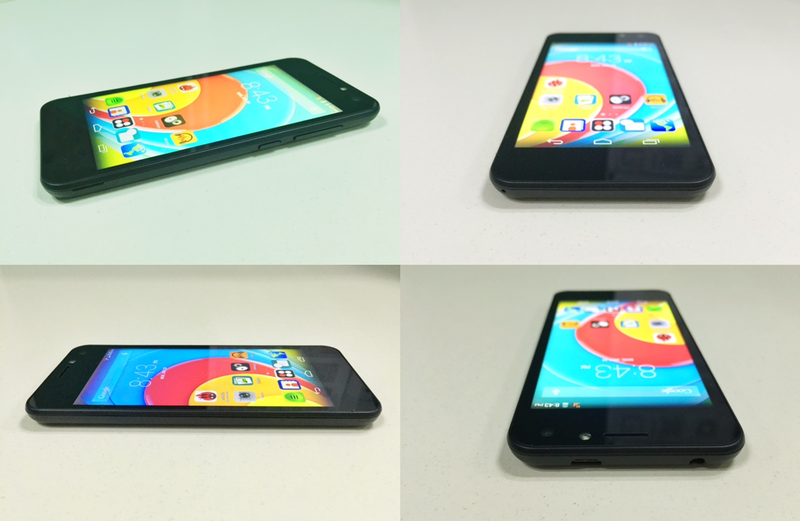 The handset is now available in all O+ Plus Concept stores nationwide. In Cebu, you can get the handset over the O+ Concept Store in SM City Cebu Cyberzone. It has an asking price of Php 4995; however, you can only get it at Php 3,995 if you purchase it on or before August 31. It also comes free if you buy an O+ Fab Elite 2.0 or O+ 360 Extreme with the O+ 360 Anniversary promo.